Holistic Pet Care – Catch the Wave of the Future | Edgar Cayce's A.R.E. Holistic veterinary care is in great demand these days. The term "holistic" implies that the entire being—body, mind and spirit—is being addressed. The whole is considered to be greater than the sum of its parts. This concept stands in direct opposition to the Western reductionistic view of life. Modern medicine tends to break systems down into smaller and smaller pieces, reducing them to their basic building blocks to gain an understanding. While this approach can help us understand how the body works, often the modern doctor loses sight of the forest for the trees. Holistic medicine takes many forms, but there are common beliefs among these various techniques. First of all, health is considered to be more than simply the absence of disease. It is a state of well-being expressed as a vitality that resists disease. Health is a dynamic balance of internal and external forces. From this point of view, there is a broad spectrum of physical conditions ranging from perfect health to death. As an animal declines from health toward disease, she is first affected by dis-ease. 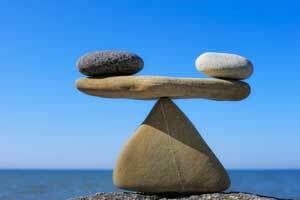 Dis-ease begins as an imbalance, which may go undetected by conventional means. If left untreated at this early stage, detectable disease and possibly death will eventually result. Often, holistic approaches to health can detect problems at the dis-ease state and correct the imbalance before disease sets in. Holistic therapies embrace the vitalist concept that has been abandoned by conventional medicine. The vitalists believe that there is more to the body than meets the eye. There is a vital energy that animates the flesh. The Chinese call it "Qi," the Japanese call it "Ki," the doctors of India call it "Prana," homeopaths call it the "Vital Force," and chiropractors call it the "Innate." It is this life force energy that is the difference between life and death, and it must be nourished to maintain true health. While conventional medicine fights disease, holistic therapies generally strengthen the body. The body is viewed as containing its own pharmacy. Research bears this fact out. You may have heard of the “placebo effect.” This medical anomaly predicts that 30% of subjects treated with a sugar pill will improve; no matter what the disease is. High blood pressure, low blood pressure, allergies—all can be alleviated by the patients' own bodies. It is considered a case of mind over matter but it proves that our bodies can heal themselves if conditions are right. The idea of holistic therapies is to produce the right conditions for the body to produce true health. Of course, fighting disease and strengthening the body are not mutually exclusive approaches to health. For me, holistic pet care embraces the best of what each has to offer. This concept is referred to as integrative medicine. There are some cases for which surgery or antibiotics may be the best option. At the same time acupuncture, chiropractic, herbs or nutritional supplements may be used to speed healing in conjunction with or in place of Western medicine. Diet is the basis of health. It is very difficult to build a healthy body if you do not supply it with wholesome building materials. As is so often the case, when it comes to nutrition, the closer we stick to Mother Nature, the better off we are. Animals evolved over millions of years eating unprocessed diets that are much different than what we currently offer them. Eating strictly processed foods is as unhealthy for our pets as it is for us. Feeding a balanced raw diet is best for pets. Vaccines are an important tool for disease prevention in veterinary medicine. Just like any tool, it can cause more harm than good if used improperly. Yearly distemper vaccines should be a thing of the past. Many studies now show that this vaccine lasts for years in the majority of pets. Vaccinating an animal more than necessary does not make them more immune to disease. Instead, it damages the pet’s immune system. Pets should be vaccinated based on their individual disease risk and immune status. There is a reason that many pet caregivers are seeking alternatives to conventional care. While Western medicine can be important in some situations, there are times when holistic methods work better. Combining the best of East and West is the emerging paradigm of health care. This holistic-integrative approach to wellness is the wave of the future, and in my view, is the best option for both pets and people. Dr. Doug Knueven received his veterinary degree from Ohio State University in 1987. He owns and operates Beaver Animal Clinic in Beaver, PA (near Pittsburgh) where he shares duties with 2 other veterinarians. He has earned certification in veterinary acupuncture, veterinary Chinese herbal medicine and veterinary chiropractic. He also has advanced training in natural nutrition, massage therapy and homeopathy. Dr Doug has been practicing alternative veterinary medicine since 1995. He lectures on the subject at state and national veterinary conferences including the annual AVMA convention and the North American Veterinary Conference which is the largest veterinary conference in the world. He has written two books on the subject; Standby Me: A Holistic Handbook for Animals, Their People and the Lives They ShareTogether, and The Holistic Health Guide: Natural Care for the Whole Dog. He also authors the “Holistic Pet Care” column for Venture Inward Magazine, available online to members at EdgarCayce.org/members. He’ll be in Virginia Beach on Saturday, November 16 from 10 a.m. until 12 noon for the Top Ten Practical Tips on Holistic Pet Care program, a free event sponsored by the A.R.E. Bookstore & Gift Shop.